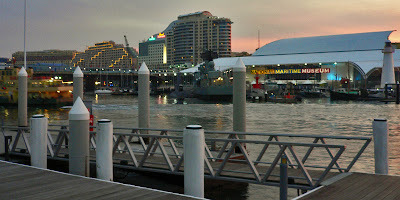 Yesterday, Thursday, I met Brendan in Sydney and we walked to Darling Harbour. We went to the Pontoon Bar to sit, drink a beer or two and discuss various things. The bar has a nice view of the harbour. It's a hangout for the after work crowd. Really great place. After he left for home I wandered around and took some pictures. 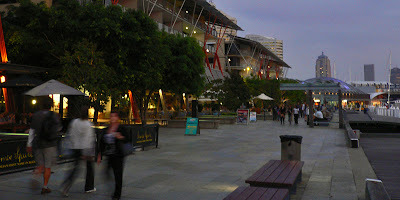 As I wrote before, this area has many restaurants overlooking the harbour. I think I'll visit this area one more time before I leave for home. Here are a couple of views. The light was fading fast.